In 1974, Donald Knuth wrote, "We should forget about small efficiencies, say about 97% of the time: premature optimization is the root of all evil." With computers available now that are millions of times faster than those available then, today's programmers have even less reason to worry about shaving cycles and saving bytes than those a generation ago. But "less" isn't "none": every once in a while, squeezing the last ounce of performance out of the machine really does matter. 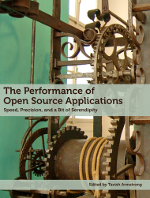 This book is written by over a dozen developers who have grappled with slow code, memory leaks, or uncontrollable latency in open source software. They share their mistakes and successes, and give the reader an over-the-shoulder view of how they approached their specific challenges. With examples from bioinformatics research code to web browsers, the solutions are as varied as the problems. This book will help junior and senior developers alike understand how their colleagues think about performance.